I learned a lot of new things about Kickstarting a board game with today’s guests. For example, it’s very normal for a Kickstarter campaign to not be funded. I’m very happy to have met Leslie and her partner Sammie. They seem to be a very good game designer (Sammie) and game developer (Leslie) combo. There are many other great things I learned through today’s interview so let’s jump right in. Or follow their progress on Twitter here. And you can show them support by visiting their Kickstarter campaign. 1. When was the first time you remember wanting to create a game of your own? Starting at the age of 4 or 5, I and the other neighborhood kids loved playing games like Hide and Seek every day. But like many unwritten childhood games, the rules were loosely structured, and they got chaotic fast. The list went on, and each rules dispute threatened to ruin an afternoon of playing. I took up the mantle and began proposing rules, and in the process I got my first taste of playtesting feedback! Other players skipped numbers. Etc. So eventually we agreed to count from 1 to 20 making sure every number is fully audible, with a pause between each. That gave us just enough time to secure a decent hiding spot or put us in risk of being caught if we opted for a spot that was more valuable but slower to set-up. In that process, we developed complete rules that we were able to follow, while preventing cheating. The game of Tag, on the other hand, was so massively chaotic that I needed structure to it. It’s essentially just a bunch of kids chasing each other, with physical tagging that, at times, got way too violent. With the feedback of open-minded peers, I was able to turn Tag into a completely unique game that we called Brum Brum Tag. Named such because the base location of the game was like a pit stop on a race track where you’re allowed for a limited time to be immune to tagging — we eventually adopted the tradition of making a “vroom vroom” engine noise when we started running off base. Using the name Vroom Vroom Tag in conversation caused us to slangily shorten it to Brum Brum Tag. 2. Was it difficult finding playtesters for Rabbit Island? How/Where did you find them? I have wonderful friends and family who are happy to test any new wacky game idea I come up with. They’re an excellent and honest first line of testing, helping me work the kinks out, ultimately deciding the fate of the game. “Rabbit Island” is the first game to survive that rigorous gauntlet; many other games are now binned in a prototype graveyard. It’s sad to see those games go, but it’s also important to know when to let go of a mediocre idea. After that initial success, I set “Rabbit Island” aside and didn’t think about it. But my wife, Leslie, saw so much good in “Rabbit Island” that she turned it into her project, visiting conventions and doing some serious legwork to not only get the game in front of dozens of audiences, but also to develop a beautiful prototype! I cannot thank Leslie enough for the countless hours she’s invested into developing “Rabbit Island”. 3. What was the most challenging part of designing Rabbit Island? Originally, there was a “hermit” status, where, if you ran out of carrots, you would retreat off the board. On your turn as a hermit, instead of moving, you would simply draw Action Cards, allowing you to wreak havoc on the island. Being a hermit would end once you gained carrots and you’d return to the board. While it was really fun for some players to exact revenge, others found it disheartening, and worse — some players exploited the status to quickly collect Action Cards in the early game. The Hermit status had to be dropped. But what could we do? There needed to be some penalty for being unable to pay a mandatory cost. Lose the game? Oh, heavens no. Player elimination isn’t fun unless a game takes less than 10 minutes to play. Leslie suggested dropping all mandatory costs. I was initially hesitant, and for good reason: it would require a complete upheaval of the game rules and all Territories would need to be re-balanced. But, at the same time, “Rabbit Island” needed to be changed, and we had no other ideas. So I retreated and basically became a hermit in real life to rework everything. It wasn’t easy, though. I had to re-balance everything over and over. Game after game, the experience improved. We identified issues, but none were as daunting as the initial scrapping of the Hermit status. We fixed each problem relatively quickly after that! With so many changes, the “Rabbit Island” rulebook has undergone so many revisions to evolve into what it is now. It’s with good reason that it’s reached version #15! 4. What was something that you dreaded about making your board game that ended up being much easier than you expected? The physical shape of the Map Tiles was surprisingly easy to design. Originally, map tiles were just regular playing cards with arrows on them, but it was difficult for players to see the island’s paths. Leslie tried making many, many redesigns, and it was an absolutely frustrating ordeal for her. That part wasn’t easy at all. Once we agreed that we’d have to make a custom die-cut shape for Map Tiles, they went through very few designs before we found the ideal shape. A common praise about “Rabbit Island” is how easy it is to play with the Map Tiles, and how the original design makes the game stand out. It’s been a wonderful learning experience. There’s more to designing a game than just writing rules, making a prototype, and balancing the strategies. You’ve got to make sure your game is easy to understand, visually appealing, and most importantly, fun! A game is something people interact with, and it’s crucial to be attentive to your players needs — even their tiny frustrations. Constant feedback is how you create a fantastic game! 1. What are your primary duties as a game developer? Note that many people may conflate “game designer” with “game developer” – I did for a long time, actually. There is also a difference between these terms in the video game and tabletop industries. We’re going to stick to tabletop definitions – since that’s the industry Sammie and I are in – so take the rest of this answer with a bit of salt if you’re coming at this from a video game background. What are the rules, challenges, goals of your game? How do you balance the numbers vs. the experience between players? What are the basic concepts of the creative design? “Game development,” then, means the further development on top of this somewhat raw platform. This is a person (or team of people) who take the game design and develop it through playtesting, conceptual marketing, revisions, etc. Creative design becomes much more important, as well as physical prototyping. If game design are the studs and drywall of a house, game development is what makes it feel like home. So, more specifically to your question: my strengths lay in creative design especially – building the world that the game inhabits, and integrating those world concepts into the game’s mechanical design. Hand-in-hand with that is knowing the market and who your consumer is. Regardless of how you (or the game designer) feel about the original creative design, if you can’t sell the game then you don’t exactly have a successful product. Initial game artist creating the prototype that proved our original tile concept and graphic design. Art director working with our amazing artist (Amber M. Scharf) to create both the box art and initial rabbit character. Eventually we will be handing our graphics over to the professionals and all of my base designs will get a great work-over! 2. Where did you promote Rabbit Island before your Kickstarter campaign? A little over two years ago, I started on my local crowd. Playtesting was the obvious reason – local game nights, friends who were able to lend an ear and a couple hours to play through the rough prototype we had and give honest feedback. I showed that we were serious about making changes by being willing to evolve and incorporate everything offered to me. Then, in November 2015, I attended my first Unpub Mini here in Richmond, VA. This was my first official game event with the prototype, and it was sincerely thrilling to get it in front of people. I made a LOT of changes to the game based off that single event – most specifically to the tiles and informative graphics. Then I went home and scheduled as many conventions as I could reasonably get to within an 8-hour driving window. In 2016, either Sammie or I attended 14 conventions and/or game events in total (and another 3 just this year). This number doesn’t include continuing to attend local game nights at friends’ houses or jobs, etc. We worked for our final product. And, in doing so, we promoted the game and ourselves. 3. Where did you promote during your campaign? Ah, this is a different story. Your crowd is online even when you originally met them in person. You funnel them to online contacts – Twitter, Facebook, a mailing list, Instagram, etc. etc. Time on the road during a campaign feels like time wasted, time that should be used interacting with your new online consumer base. Of course there’s no reason why you couldn’t do a convention or promotional event, but having a larger team helps with that so that you don’t lose connection on the home front. The smaller your company/team, the more you have to work to maintain a reach. I set up a Facebook event for our first day to encourage my crowd to flock to the campaign page and get those first pledges in (we hit 16% funding in the first 24 hours). 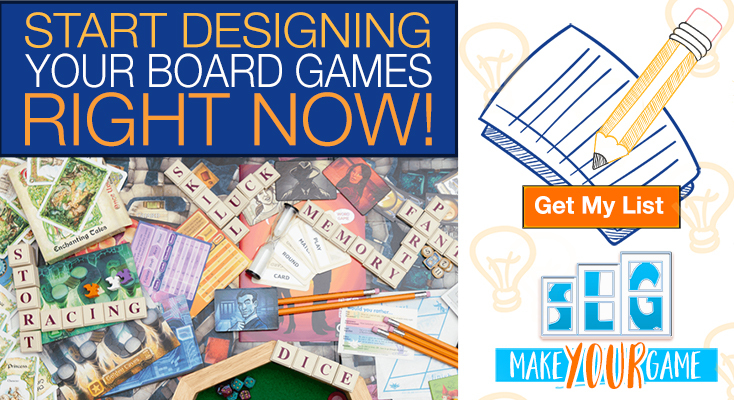 I set up advertising on BoardGameGeek to try and reach a wider crowd. And accepted invites to do interviews and proactively reached out to post links on Facebook, Reddit, and other social media sites. In the two months leading up to the campaign launch, I also contacted multiple reviewers to secure spots in their review & preview schedules that would correspond with our launch. All of this with the hope that we’d reach a wide variety of gamers and other interested parties. 4. What have you found to be the best place to promote your board game for the amount of time it takes to do so? This is an interesting question – I’d say Facebook’s tabletop gaming groups have been a HUGE help. Both on the publishing and direct-to-consumer sides. While the first two are pretty self-explanatory, the third one has been a great community for figuring out what an average board game consumer may respond positively to. Knowing how to connect to your consumer base is an important step of marketing. If you find that part of game design overwhelming or overly hard, then it may be worth trying to partner with someone you know who’s got a better handle on it, or pitching your game to a publisher instead of trying to see it through yourself. It’s going to be either your or the publisher’s job to know who your game will appeal to and how to touch base with them. 5. How long did it take you to set up your Kickstarter? It took easily the better part of a year to study how to set up a Kickstarter, or maybe a bit more. There wasn’t a point where I was like, “This is the day I’m starting!” so it’s hard to estimate. I bought a copy of Jamey Stegmaier’s book, A Crowdfunder’s Strategy Guide, and read dozens of articles on a dozen topics (reviews, blogging, social media, professional prototypes, building a crowd, etc.). I took careful notes on Trello, which I highly recommend to anyone needing to organize their thoughts and/or plans. As for the campaign itself, it took me about a month to finish writing the copy, making the graphics, and pulling together the KS and How to Play videos – and that wasn’t nearly a long enough amount of time, in retrospect. Luckily, you can continue to tweak your campaign design after your campaign goes live. So you can add and take things out as need-be. Calvin – You have an awesome pledge level called “Carrot Bonus!” where the first 10 backers that pledge $82 or more get a game PLUS a prototype. This is a fun reward as it allows the backers to play the game early. It seems like it went over really well as the 10 spots sold out quickly. A) Where did you come up with this idea, Leslie? I had 10 prototypes – what I had been calling “review copies” because I sent them out to reviewers – left over from a big print run I had done in 2016. The big thing here was making the prototypes worth the cost; I had to pay for a die mold for the original tile shapes, and that wasn’t exactly inexpensive, so I went ahead and got a 2 dozen games made just to be on the safe side. It meant I also had a really nice copy (comparatively) to take with me to cons and to send to friends who had dedicated gaming groups so they could show it off as well. B) Where did you have your prototypes made? I used both AdMagic’s Print & Play service (P&P) and a local print shop (Wythken Printing here in Richmond, VA). P&P produced my custom map tiles and carrot tokens. Blank game boxes to put everything in. The local printing company did my Action & Movement Card decks and my score pads. Oh, and I guess I also did use Amazon to buy a box of wooden golf pencils to go in each copy. C) Did you have to print additional prototypes to fulfill this goal or did you have 10 prototypes already printed for playtesting? I didn’t have to print anything special for this goal except the Rule Book and Quick Reference Sheets. When I made these prototypes, these were the only two components still in flux. When sending copies to the reviewers, I just printed out the most up-to-date copy of each and packed them in with the game which is the same thing I would do for these backers. D) What (if any) are the downsides to doing this? The downside is that the prototype doesn’t reflect the final art or cleaned up graphics that the final version will. You can still functionally play the game, and it’s a LOT nicer than playing a print’n’play version, but it looks pretty much like a prototype. Many people approach a prototype much differently than they do a polished game! This means the onus is on the person introducing the prototype to their friends to reassure them that it is a finished game, it will be fun, don’t judge it based on the component quality, etc. Calvin – Sammie and Leslie closed their initial Kickstarter campaign and relaunched in February 2017. I wanted to find out more about their decision to close the first campaign 13 days in and relaunch several months later. 1. Why did you cancel your Kickstarter campaign? The simplest answer is: I didn’t want to watch it fail in real time. Canceling it gave me more control over the outcome. 2) whether or not you should cancel a failing campaign or let it run its course. So, let’s tackle #1 first – how did I know my campaign was failing? As I posted in my “Postponement Update” to the Backers, like so many things in life, Kickstarter is a numbers game. We simply weren’t in a place by Day 13 that I could confidently say that we would fund. I’ve kind of already answered #2 with my short answer – letting the campaign run a failing course was never an option for me. I’ve spent too much time researching projects to base too much on the “hope” that I’d be able to revive it half-way through. 2. Based on your extensive research over the last year, is this common for other Kickstarter campaigns? A few companies have been nice enough to write up their relaunch stories so those of us who are going down a similar path can learn from their mistakes and their successes. Outer Limit Games has one that really pours over the numbers and consumer feedback. I was able to use articles like these to come up with my own post-campaign survey to help point me in the right direction for the relaunch. I’ve taken all this to mean that I shouldn’t necessarily be upset that my Kickstarter nosedived – there were some CLEAR shortcomings that I had honestly hoped wouldn’t hold us up, and when they did, I knew I had to postpone the campaign and throw some more time, money, and effort into the project. 3. What are your plans for relaunching your Kickstarter campaign? The previous backers made their desires very clear: they wanted better art. The biggest thing our campaign was lacking was a decent representation of what we wanted our final art to look like. We had beautiful box art, a great representative of the game (Russet the Rabbit), but no finished tile art, blank Action & Movement Cards, unfinished Carrot Tokens….ugh. So, back to the literal drawing board for our artist. Amber M. Scharf worked for the last couple months to get us our new tiles, which we’re proudly showing off wherever we can. If we fund prior to the campaign being over, I’ll be happy to get her to start working on the three other Rabbit Leaders that will be showcased in the game. After art, finding a new game printer was crucial in bringing the price point of the game down. LongPack Games was who we chose as our printer this time around. We were able to lower the cost of the product and our overall campaign goal by a very decent amount, for which I’m hoping we’ll be rewarded with new backers. Finally, we cleaned up the campaign video & campaign page. I’m hoping that this go-around will look better, but our efforts are only part of the overall draw – the consumer will ultimately decide our fate in the coming month, and we’re hoping we hold up to their standards! And Now a Question for our readers! Thanks Sammie and Leslie for an amazing interview. That was extremely helpful and insightful. Now I want to know what our readers thoughts are about relaunching a Kickstarter campaign. If you have any research or personal experience related to this topic, I would love to learn from you as well. You can leave a comment below and help everyone else out.